1. Only for Facebook section in YLH website. 2. Can skip eror page when click "Confirm button/ like" with automatic. 3. Loop with 999 time (you can edit how many loop you want, just replace 999 number with any number). Note : "Don't edit the script, unless you know what you're doing". #Instal iMacros on your browser. 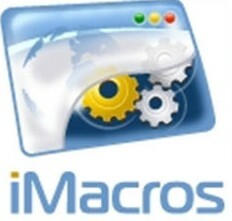 #After that open you'r iMacros #installation folder, and move or copy my script on iMacros folder. #Login you'r FB account and YouLikeHits site. #Chose Facebook section + hit Like button first. #After that you can run my script. Thank You Soo Much Pretorian for sharing the macro. It is working for me faster than other bots. Thnx! After you instal addon firefox will be restart and open again. Now put my script on iMacros installation folders. I don't know why you'r site got banned, my be you'r site use ilegal script or you'r site has been report because any reason. For youtube iMacros is simple to create, but only in .iim type not .js. Put My script on that folders. Working like a charm for me. Great Share Once Again Bro! Change TAG Confirm to : TAG POS=1 TYPE=A ATTR=TXT:ConfirmLike&GetPoints! Sorry I mean : TAG POS=1 TYPE=A ATTR=TXT:Confirm < SP > Like < SP > & < SP > Get < SP > Points! Note : "without space/ remove all space". i edit the macro but it will like but stock in the one that i will edit the tag pos. Can u change the download sir tnx. Code and link allready *update-enjoyed. Awesome it actually works.Love u guys!! I'm very very very happy for this script. You are very helpful person. Sir Can u make imacros For pinterest(. )com its getting popular thankyou. Program stopped at:"TAG POS=1 TYPE=SPAN ATTR=CLASS:liketext"
IMacros can not run automatically, please help me! Sorry, not this time..Check back soon. For me nothing error happens. Because I use a firefox browser that has been edited by me, but I will check with use a another firefox browser was not editable. By the way I use a editable browser(Firefox), so nothing problem when I use my script. As you see on the video that's my editable Firefox browser and private just for me :) sorry. Can you please update the imacros who can like by opening another window? My mean to say who can like from Facebook fan page and get back to ylh for points. Hi Admin, love this script! However i cannot get it to show points, it just likes pages then moves on to the next page. I have read this whole blog and i do not know which line to edit to make it confirm. Please help, u rock! HI ADMIN, i love this but i have ran into a problem, when i play the script, it seems to like the page but not confirm, i do not get any points added? My script doesnt seem to run through the whole script? Please could you help me, this is a great script but i am sure i am doing everything as instructed! Hi admin, please may you help me here, i seem to be able to run this script (thanks by the way, ur the man)but it doesnt seem to be confirming the points, it just likes a page, then seems to quickly move on to the next page and likes etc. I am using the latest version on imacros on firefox. Please could you take a look and see if its working on your end? maybe ylh have made an update or is it just my inexperienced problem? How do I insert the javascrrr in internet explorer? For all.. my script now only works with my personal editable browser(FireFox). Because a couple weeks ago YLH website owner has update their database in full section especially Facebook section. And for another browser my script not fully working it's got trouble when clik like text and confirm button. With my editable browser(firefox) my script still works 100%. But sorry my editable browser(firefox) is very personal and only for me.